Here at Rhine Valley Game Calls we try and meet the needs of all types of Hunters and Fisherman (Women). We carry some supplies for Bow Fishing and we will be adding more in tne near future. 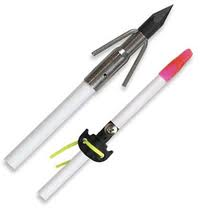 Muzzy Bow Fishing Arrows with Carp Tip. AMS Retriever Reels (Right or Left Handed). Muzzy (Bright Orange or Bright Yellow) Fishing Line. Rhine Valley (Orange) Finger Savers. Rhine Valley (Pink) Finger Savers. Rhine Valley (Black) Finger Savers. Cajun Bowfishing String 50# 250 Yards.